For governments, the Debt-to-Income ratio is no different, except that here the burden of national debt uses Gross Domestic Product (GDP) to represent the national income. So if we were to calculate the National Debt-to-Income Ratio for the U.S. government, which of the following possible answers do you suppose would be the correct figure to describe the national debt burden for the first quarter of 2018, where the U.S. GDP was recorded to be $19,960.1 billion and the total public debt outstanding of the U.S. government was $21,089.6 billion? By the end of this year, the ratio of federal debt to the United States’ gross domestic product will reach 78 percent, according to the CBO, the highest ratio since 1950. The debt is projected to grow to 96 percent of GDP by 2028 before eventually surpassing the historical high of 106 percent it reached in 1946. So how is that possible? The short answer is that the CBO is using a different number to represent the national debt in calculating the U.S. National Debt-To-Income Ratio. Specifically, it is substituting the portion of the national debt that is held by the public, which currently totals $15,428.0 billion, for the nation’s total public debt outstanding in their calculations. This omits the intragovernmental portion of the national debt, which totals $5,661.6 billion. But why on earth would you omit the intragovernmental portion of the national debt from the calculation of the national debt burden? A number of prominent economists would argue that they should ignore this portion of the national debt because this money is literally “money that we owe ourselves”. Except that the CBO’s own analysis of the U.S. government’s Long-Term Budget Outlook and its 10-year Budget and Economic Outlook for 2018 confirms that it isn’t. That’s mainly because of the pending depletion of Social Security’s trust funds, which the CBO’s analysts predict will happen after 2031. Because much of the intragovernmental portion of the national debt is made up of IOUs that the government wrote to itself as it “borrowed” money from Social Security’s trust funds to sustain its spending at levels in excess of the revenues that it has had, and because the CBO doesn’t believe that the U.S. government will ever be capable of collecting enough revenue to cover the full cost of what U.S. politicians will spend, much of this “intragovernmental” portion of the U.S. national debt will be transformed into “Debt Held by the Public” over the next 15 years. We can see that in the above chart as the percentage of Public Debt Held by the Public grows from 73 percent of the U.S. government’s Total Public Debt Outstanding in 2017 to 90 percent over the next 15 years. At the same time, the CBO projections suggest that the total national debt will nearly double from $20 trillion in 2017 to $40 trillion in 2032. 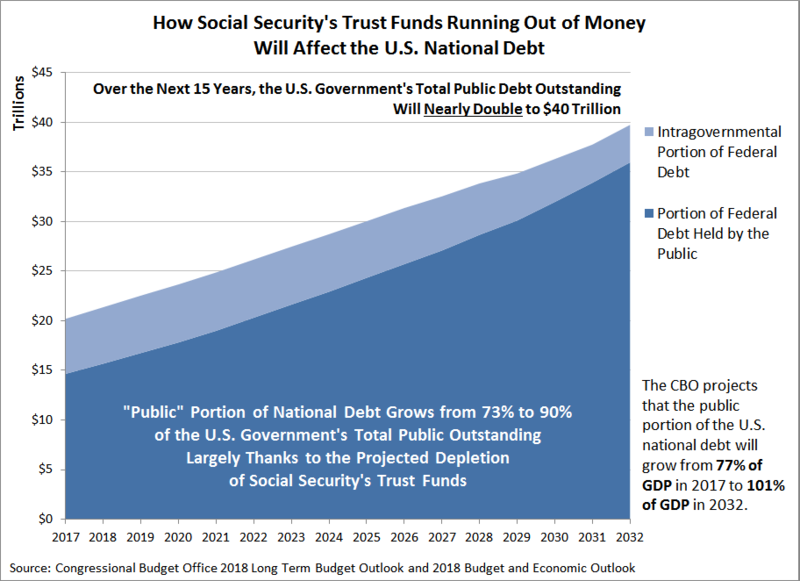 The CBO’s projected transformation of so much of the U.S. government’s “Intragovernmental” Debt into “Debt Held by the Public” reveals that the money that the government owes to itself is little more than an accounting farce. It’s one aimed at purposefully understating the true magnitude of the U.S. government’s debt burden today because it ignores how the government will need to obtain the money that it will use to pay off much of its accumulated intragovernmental debt burden. Such is the myth of the money that the government owes itself.